Hugh Hewitt spent almost three hours this week with Hussam Ayloush—a spokesman from the Southern California Chapter of the Council on American-Islamic Relations (CAIR). Wow, what an eye-opening interview. Hewitt nailed Mr. Ayloush with a question about the unprovoked attacks on Israel in 1948 and 1973. The CAIR representative saw nothing wrong with surprise military attacks on Israel with no provocation. He also had excuses about why the people in the Palestinian refugee camps were taught in school with maps that purposely-left Israel off the Middle-East maps. At the mention of Israel, Mr. Ayloush went into attack mode and accused Hewitt of being a Jew lover and a hater of Islam. He then went on to accuse Hewitt of being a racist and a bigot. When pressed for answers, Ayloush went into a lame retort that he is a simple engineer and not a politician. In other words he was not qualified to speak on these matters. Excuse me, Hussam Ayloush, you were there as a spokesman for CAIR! This dumb bumpkin from the carpet bazaar act may work with some folks but he picked the wrong host on which to pull that stunt. CAIR was revealed to be what I have often heard them accused of being, they masquerade as loves of peace and democracy but their true aims are the same as the terrorisms that plague the world today. They are obstructionists to a solution. Instead they run interference and provide cover for those sworn to kills us. I often wonder if their brother Muslims were such caring and loving people as Mr.Ayloush claims, then why have they forced the Palestinians to live in refugee camps for over half a century? There is more than enough land and money in the Arab countries that if they wanted to absorb the Palestinians into neighboring countries they could. Apparently, it is better politics for Arab rulers to keep the peasants stirred-up about a non-existent external threat (Israel)that oppresses their brothers than to confront the oppression in their own nations. 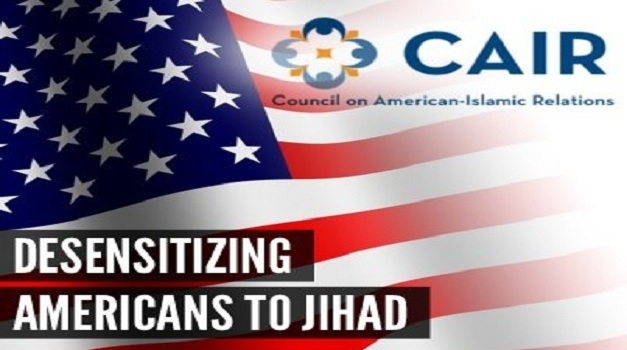 CAIR will provide political cover and legal representation for terrorists but is not interested in rooting out the terrorists in their own community. Its too bad. If they wont deal with their own people, they will create a situation where those outside the community that they claim to represent will have to do it for them. They are setting-up the circumstances that they claim to be trying to prevent. (This is a common tactic of many special interest groups.) When a crackdown begins on their people they will have no one to blame but themselves.